The website and your relations with Les Vignerons de Buzet are governed by French law. The www.nouslesvigneronsdebuzet.fr website is registered with the CNIL under number 1396101. The written and visual content of this website, and the manner in which data and information are presentation on the website, are protected by copyright and other intellectual property rights laws. Any partial or complete paper or digital copy of the www.nouslesvigneronsdebuzet.fr website must be authorised by Vignerons de Buzet. The request must specify the desired content, as well as the publication or website where it will be reused with the source. The design and production of the www.nouslesvigneronsdebuzet.fr website were carried out by the company Profil Web. It is maintained by the agency Profil Web. - for any interruption to the website. - for the occurrence of any bugs. - for the inaccuracy or lack of any information available on this website. - for the connection of any person not of legal age to consume alcohol. And more generally for any direct or indirect losses, whatever the cause, origin, nature or consequence, including in particular any costs arising from the purchasing of goods offered on the website, loss of profits, customers, data, or any other intangible losses that may result from anyone accessing the website, or not being able to access it, or the reliance on any information obtained directly or indirectly from the website. 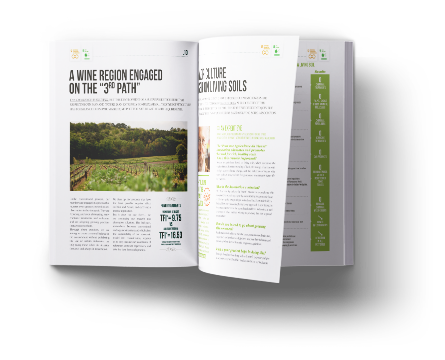 The www.nouslesvigneronsdebuzet.fr website contains several links to other websites, mainly official websites of associations, professional organisations, or partner businesses. These pages, whose addresses are regularly checked, are not part of the website and the editors of the website are not liable for the pages to which these links direct. They are solely intended to give the user easier access to other documentation on the subject consulted. Personal data collected by www.nouslesvigneronsdebuzet.fr are for internal use only. This data will, under no circumstances, by communicated or sold to third parties. In accordance with French law, the www.nouslesvigneronsdebuzet.fr website is registered with the CNIL (French data protection body). You have the right to access, modify, rectify and delete any of your personal data. Any partial or complete paper or digital copying of the www.nouslesvigneronsdebuzet.fr website must be authorized by Vignerons de Buzet. Cookies are small text files (pages viewed, date and time of viewing, URL from which you came to our website, etc.) saved on your computer’s hard-drive by a web page server. Your browser is probably configured to accept cookies. These cookies do not allow you to be identified, they are used to analyse and measure visits to our website, and to therefore improve site navigation and facilitate access to the services on offer. We remind you that the abuse of alcohol is dangerous for your health and that the wines of Les Vignerons de Buzet should be consumed with moderation. The sale of alcohol to minors is prohibited (in accordance with the ordonnance n°59-107 of 7 January 1959 and the law n°74-631 of 5 July 1974). Any person placing an order with Les Vignerons de Buzet confirms that, at the date of the order, they are of, or older than, the minimum legal age for the purchase and consumption of alcoholic beverages. By visiting the website, the buyer declares to Les Vignerons de Buzet that they are of legal drinking age and are fully able to exercise their rights.